My Perspective on Design as a Creative Problem Solver. Before entering design studio to develop as a designer, I was equal portions artist and engineer wrapped together to be labeled a creative problem solver. During the course of school it would become a careful balance of remaining true to the creative problem solver I had at my core while exploring the world of design and the future I'd have a hand in creating. After two years of making design decisions based on my intuition, I began to think more deeply about the built environment and the people I was designing for. Over the course of five years and ten ambitious design studios, I dug deep to understand design. My core values remained in place, although my thoughts and perspective on how I engaged with design eve loved, expanded and dug deeper to discover the core values in design that complimented my own focus on helping facilitate everyone to engage in their world as a collective sandbox that is open for everyone to activly participate in making their world. During the first two years I used my intuition and inspiration from the world around me as an artist more than an engineer. As my understanding of myself and my world grew, I increased my focus on the relationship between people and their built environment to reconnect my initial objective to create a better world for people to live, work and enjoy life. Designing for people led my interest in designing the process itself to incorporate flexibility and agility to adapt when opportunities allowed design to work within specific situations and contexts. As my focus on people increased, I began to increase the scale of scope of design to a larger scale of vision with the addition of time as a 4th dimension of reality to incorporate a wider range of experience (builds anticipation, aesthetics, enjoyment). With complexity of relationships increased, I began to look to the computer more to help assist with the design process to design the process of creating an iterative design process using the visual programming environment of Grasshopper to building formal definitions, equations and intelligent object relationships to remove my hand from finite control of the design as built. The first two years of school provided a foundation and my understanding of myself on an intuitive level. During this time, my thoughts centered around designing the building at hand and creating something memorable. 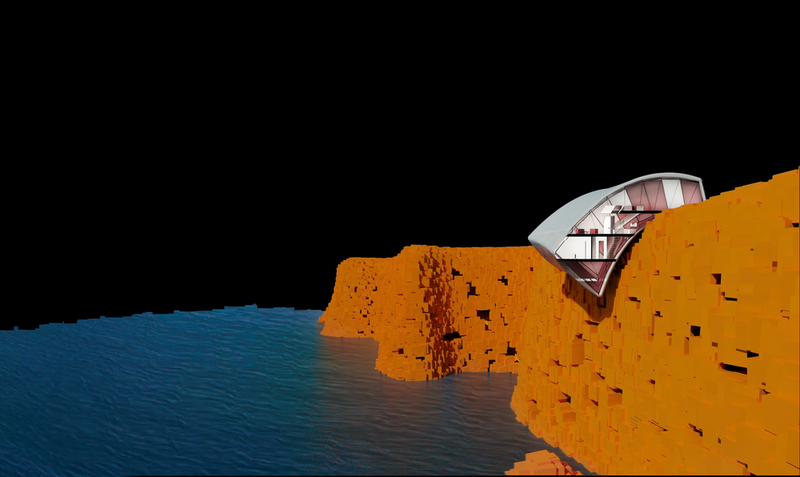 I discovered this through one of the projects in designing a house for Dali, along with others such as a bridge and a garage facade that incorporated the context to find the design solution. I began to think more deeply about the dialogue between the built environment and the people I was designing for. These projects become open and accessible, inviting people into the buildings and extending beyond their site. The Music Center for Houston Street centered around how at the heart a music center is the performance and is usually buried into the building such as not to be seen from the exterior. Like great music being played on loud speakers, the music is not restricted to the limits of the room it's played in, but is extending outward. I wondered how the rest of the building could begin to help broadcast the performance and energy from its core outward into the surrounding streets. Designing For a Specific Perspective. 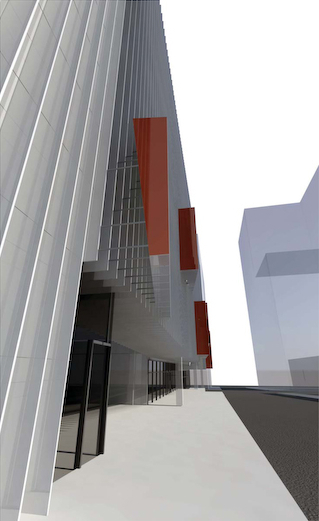 The garage facade appears opaque as you pass by it, but it remains an open set of fins. The ground floor retail signage placement is found by understanding the exact perspective of the one way street traffic as they approach the building. The building is stage and provides an opportunity for outside performances. Pushing beyond the property it is bounded to, the CBGB Music Center dissolves it's external envelope and perform as if an amplified loudspeaker to flood the surrounding context engage the potential for a larger collective body to share in the energy music activates through it's performance. 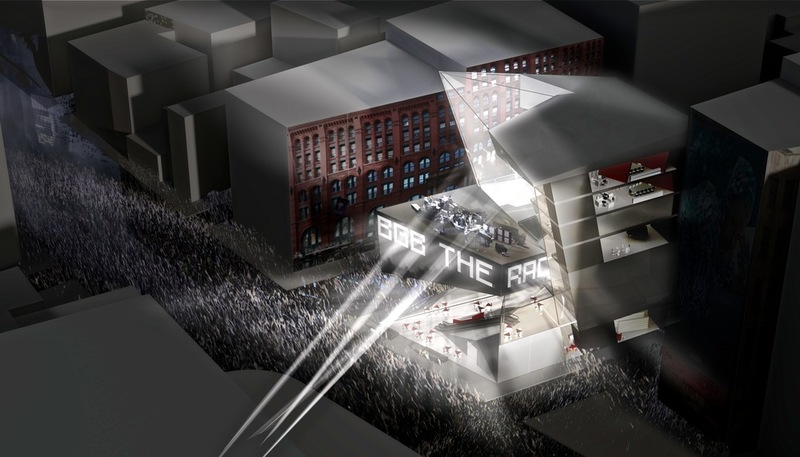 The CBGB Music Center is designed so the street is seen as an extension of the building. Transforming from a container of performance spaces into a performance space itself, the large cantilevered marquee provides opportunities for a rock concert on a magnitude appropriate for the city it is looted in. I began to be more interested in designing the process and incorporate time as an additional dimension. Two projects that use this thinking are the Film Center in Dumbo and a set of towers in downtown Warsaw. The Film Center uses one of its facades. 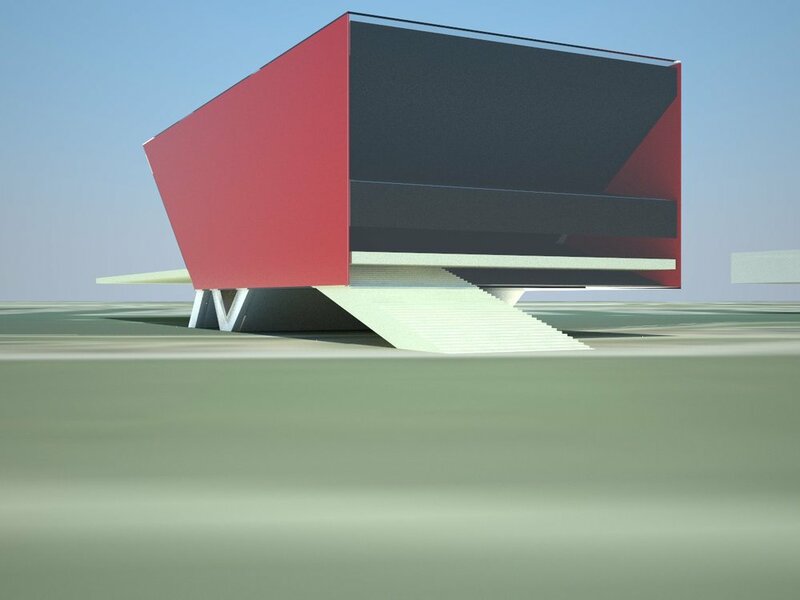 It transforms from that facade to a screen for viewing films at night. 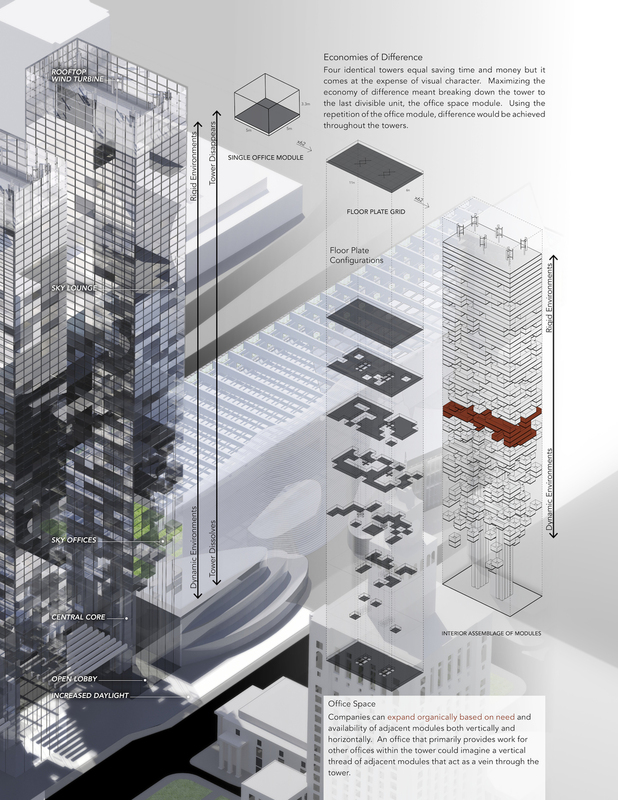 The towers in Warsaw explored designing a tower from assembling individual office cubes into large scale public icons. Individuals could easily identify their personal space because of the uniqueness of each individual floor plate in each of the four towers. This project was the first to incorporate what design computation could do and how I began to create rules for design rather than the actual floor plates themselves. My current thinking remains connected to these ideas and is a strong mixture of them. I want to design a more structured system with parameters influencing the end results less directly. Creating multi layered solutions that could satisfy a whole jury panel and their different agendas.